My experience cooking Thai food is relatively recent, but since I started experimenting a few years ago it has probably become my favorite cuisine — aside, of course, from Indian. I find the unique fragrances and flavors of Thai ingredients — coconut, lemongrass, galangal and, of course, chilies — quite irresistible, as well as being easy to combine with all sorts of vegetables to make healthy and delicious meals. 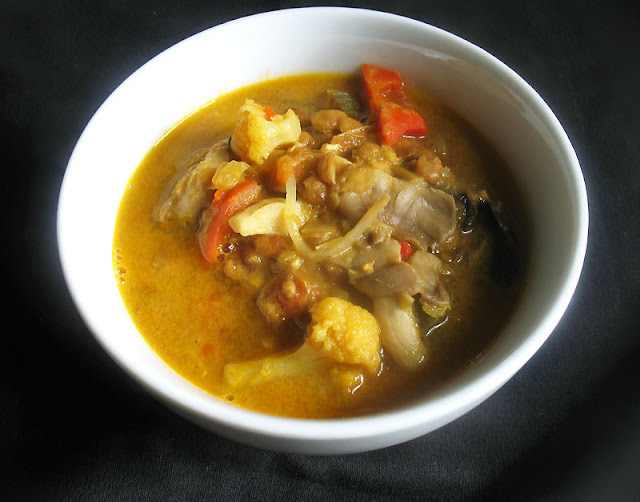 I've lately been making an effort to incorporate even more vegetables into my meals, and the presence of part of a head of cauliflower and some homemade Thai green curry paste in my refrigerator led naturally enough to a Thai-style vegetable soup. With the addition of earthy green lentils, tangy tomatoes, red peppers, bean sprouts, plump oyster mushrooms — also an essential of Thai cooking, in my humble opinion; coconut milk, tamari sauce and an assortment of spices, the result was a creamy, fragrant, hearty and nourishing soup that made the best of a blending of Thai and other south Asian cuisines. Each bowl — and in fact each spoonful — was a wonderful contrast in seasonings and textures that made it a big hit with me, my husband and my best friend Basil. Soak the dried mushrooms in 1 1/4 cups of hot water for 30 minutes. Drain, reserving the soaking water, and roughly chop the mushrooms. Set aside. Heat the oil in a large saucepan or soup pot over medium heat. When hot, add the white parts of the green onion to the pan along with the cauliflower. Stir for 5 to 7 minutes, until the onion has softened and the cauliflower begins to brown a little. Add the garlic, ginger, chilies and spices to the pan. Stir for a minute or two. Add the Thai green curry paste, stir once, and then add the tomatoes. Cook for another few minutes to slightly reduce the tomatoes. 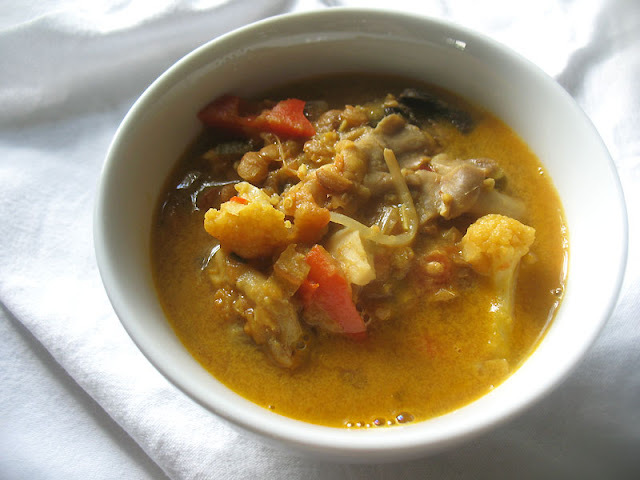 Pour in the coconut milk, 3 cups stock or water, lemongrass, the reserved mushroom soaking water, and the lentils. Bring to a boil, reduce the heat to medium low, cover, and simmer until the lentils are tender — about 25 minutes. Now add the tamari, green parts of the green onion, dried and fresh mushrooms, red pepper and bean sprouts. Simmer for another 10 to 15 minutes, adding a up to 1 cup more stock or water as necessary to achieve your desired consistency. Season with salt and pepper to taste and stir in the lime juice. Cook for another few minutes and discard the lemongrass pieces. Serve hot, alongside a bed of fresh cooked white jasmine rice. I really adore Thai style soups and this ingredient combination seems to be great. Thai is my favorite also! I love how so many different flavors are combined in each Thai dish. This soup is no exception! Delicious I will try your version of this soup. Thai is my favorite cuisine too.